The C Strcpy function is one of the String Function, which is used to copy the user specified string, or content (group of characters) from one string to another. In this article we will show you, How to use strcpy in C Programming language with example. The basic syntax of the strcpy in C Programming language is as shown below. The following function will accept two character arrays as the parameters, and it copy string data from source to destination using the built-in String function strcpy. TIP: You have to include the #include<string.h> header before using this strcpy string function. The strcpy function is used to copy the string content from source to the destination string. 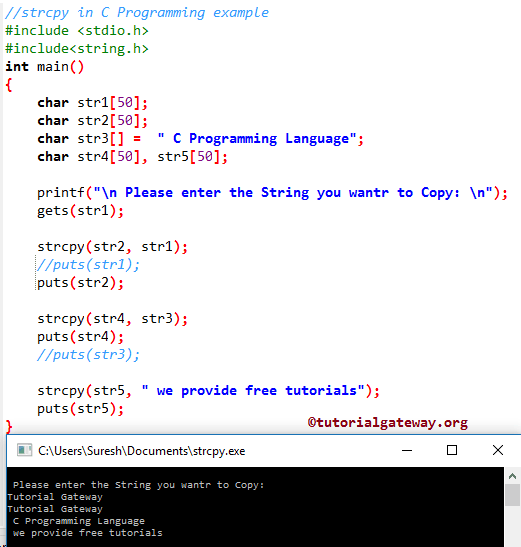 This program will help you to understand the strcpy (string copy) with example. The following C strcpy statement will copy the string data from str1 to str2. Following statement will copy the character array (string data) from str3 to str4.